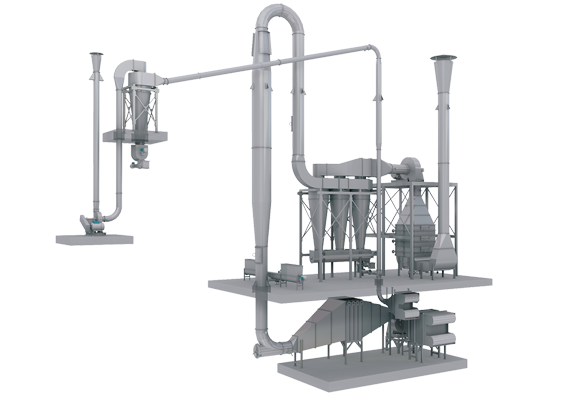 LARSSON™ flash dryer unit is designed for drying starch and fibres. LARSSON has developed the drying process for over 40 years and is today able to offer sophisticated, efficient and energy saving dryers. Two fans are used for process air, one fan for the intake air and one fan for the exhaust air. This design permits atomspheric pressure at the inlet, which means that the product can be fed into the dryer without being compressed. LARSSON flash cooler unit uses the same efficient cyclones as in the dryer unit, although the amount of starch per m3 air is higher than in the dryer unit. To meet the low emission requirements for the exhaust air of the air cooler, the exhaust air passes through one or two cyclones. This ensures clean properties of the exhaust air. LARSSON™ flash dryer can be equipped with a heat recovery unit, which further reduces energy consumption significantly.